When I visited Napier, New Zealand, I received an instant education in Art Deco architecture. Napier was destroyed by earthquake in 1931, with the loss of over 200 lives. Almost all the buildings in the centre of Napier were razed. Rebuilding was organised on a a massive scale, not only to rehouse the inhabitants, but also to supply work in the years of the Great Depression. Art Deco was very much in vogue, and as a result, all the new buildings were created in that style. In Napier you can get Art Deco overload, there's so much of it to see. Prior to going there, the only Art Deco I'd seen was an elaborate water fountain created in Art Deco style at my golf club. Rather OTT considering it was only for thirsty golfers about to tackle the tricky Par 3 eighth hole, I always thought; but still, it was in memory of a club stalwart from a past era. 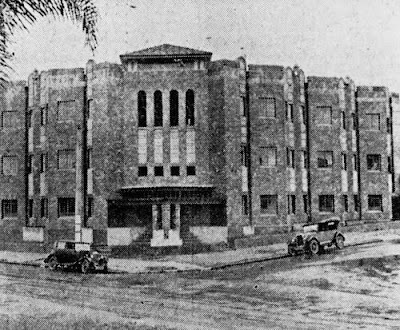 At around the time that Napier was being rebuilt and wool stores were being erected at Teneriffe, another Art Deco building was constructed at New Farm, opposite New Farm Park, on the corner of Brunswick St and Elyston Rd. Called Coronet Flats, it was a building containing nine flats, with windows overlooking the park. Here is a picture that appeared in the Brisbane Courier in 1933. It seems as though this image has been digitised from the newsprint rather than the negative, hence the low resolution. The Art Deco style is readily seen in the columns, and also in the glass window inserts in the facade. I particularly like the motor cars parked at the front of the opulent-looking building, and this newspaper photo seems to conjure up thoughts of a bygone era. Who knows what stories could be told by these nine flats? The flats remain, still looking the part. The building itself, although its architecture suggests a certain age, certainly looks as good as new; with well-kept gardens and fresh woodwork. I am pleased that I have even been able to include two more modern vehicles in the picture. Once Brisbane had the reputation of not retaining our heritage, but thankfully these days it is very difficult to demolish old buildings, or for that matter, old trees, which is just as it should be. This building, a memento of a bygone era, should be with us for many years yet. I absolutely love art deco. Thanks for the piks. I love this pic and story. Thanks tff! Hello - I have just stumbled upon this wonderful sight. Brilliant idea. Thank you for the lovely comments about our building. Coronet flats - or Coronet Court as it has been for known for a long time belongs to my family. My great grand father bought it from the architect in 1939. We have worked really hard to preserve it so it is great to read such appreciative comments. Nice building, very interesting and a real joy to look at again and again!